--Size: 3.6x3.6x0. 0.4 cm/1.4x1.4x0.16 inches. --Two-way anti lost, A key finding things, The location information, The Internet search. --Ultra-low power consumption, Multitasking management. --The Internet search, when the item is missing, the nut users can lost "statement" in the APP, all the nut APP users will help find. --Anti lost: The maximum range of the device is 50m. --You can manage 6 Nut 2 tracking tag at the same time. --Number of management: Connection 6 strips at the same time. --Language: Just have Chinese and English. Log in with Facebook, Twitter ,other social media account or American phone number to use Nut 2. 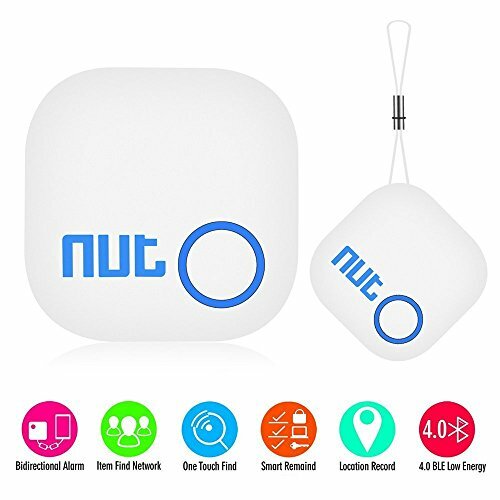 ✔ NUT SMART TAG: is a small Bluetooth tracker that electronically connects with Apple or Android devices with a tiny electronic key fob that alerts the user if the device is more than 30 meters away. ✔ ANTI-LOST MODE: Both the Nut and your device will beep to alert you when they disconnect from each other. ✔ FIND IT MODE: Once paired to your host smart phone. This device effectively allows both your phone and the Nut tracker to call each other; Note: In this mode, when the tracker is more than 30 meters away from the phone, it will disconnect and no longer alert you. ✔ LOCATION RECORD: Nut app will show you the location where and when Nut got disconnected on the map. ✔ Compatibility: IOS system 7.0 or above and Android 4.3 or above system version /Bluetooth 4.0.